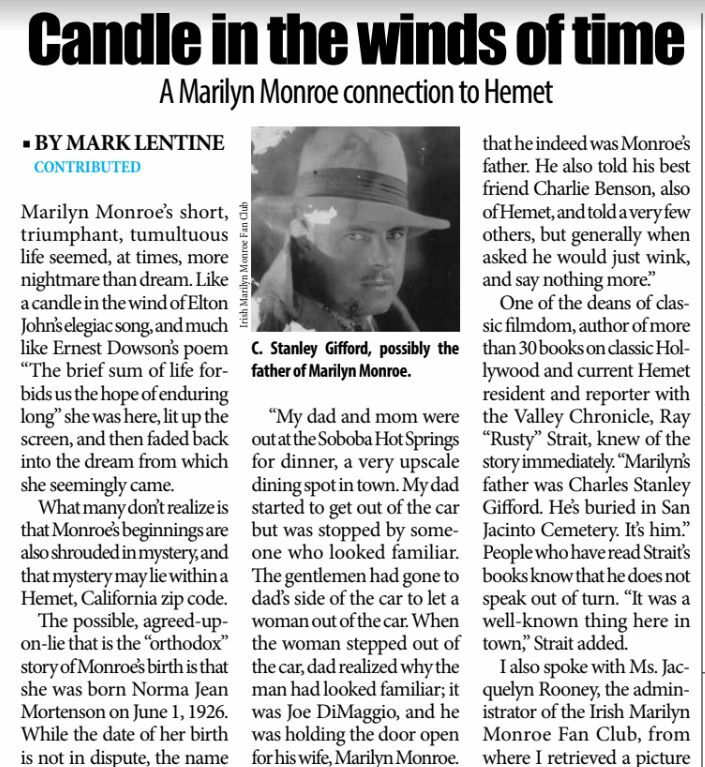 In this week’s Valley Chronicle, Mark Lentine looks at Marilyn’s connection to the California town of Hemet. 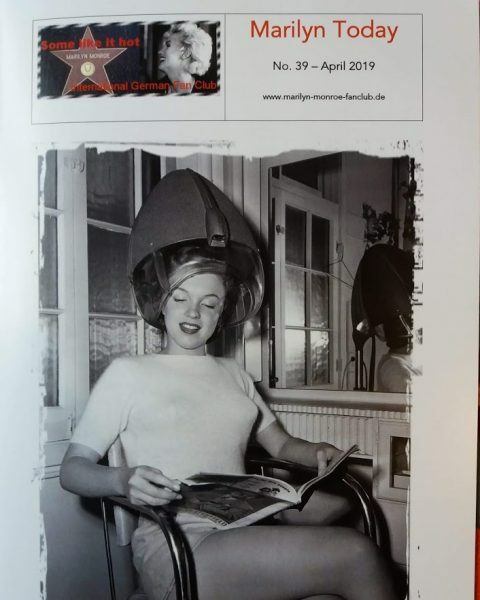 Although she was named Norma Jeane Mortensen at birth (after her mother Gladys’ estranged husband, Edward Mortensen) it is widely believed that her real father was C. Stanley Gifford. He and Gladys had a relationship while working at Consolidated Film Industries in Los Angeles. 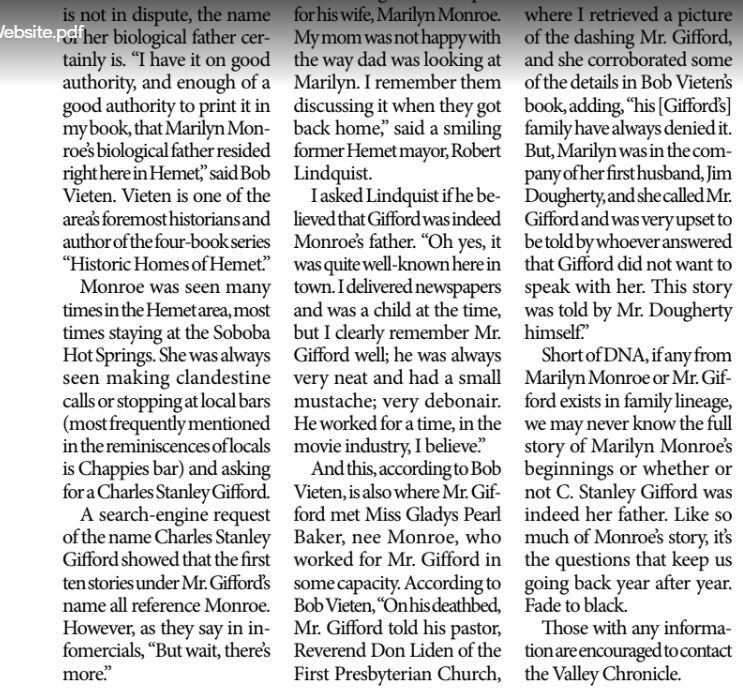 Over the years, Marilyn made many attempts to contact Gifford, without success. Gifford had remarried and managed the Red Rock Dairy in Hemet. 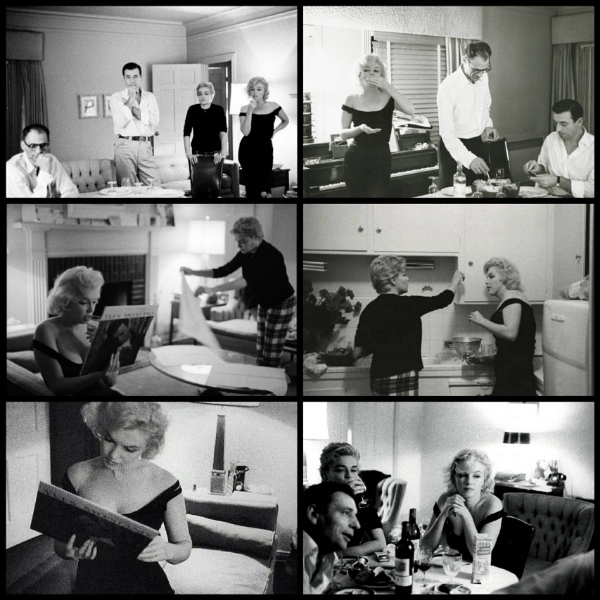 It is believed he did not want to upset his wife and children by letting Marilyn into his life. 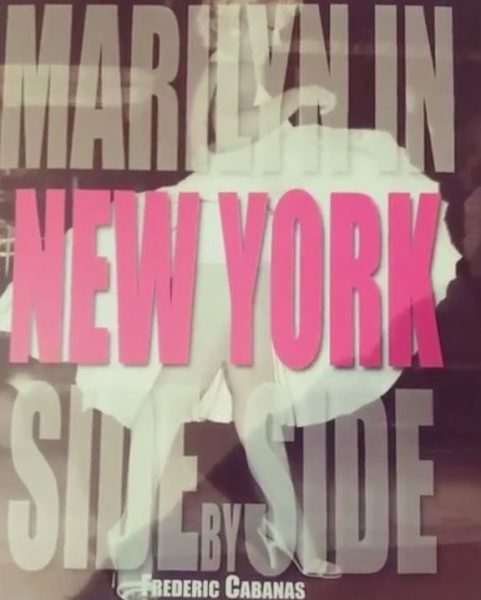 Marilyn’s half-sister Berniece Miracle has claimed that they finally met in the year before Marilyn passed, and it has been reported that in 1965, a dying Gifford confessed to his pastor, Reverend Don Liden of the First Presbyterian Church, that he was indeed Marilyn’s father. Gifford was buried in the San Jacinto Valley Cemetery. 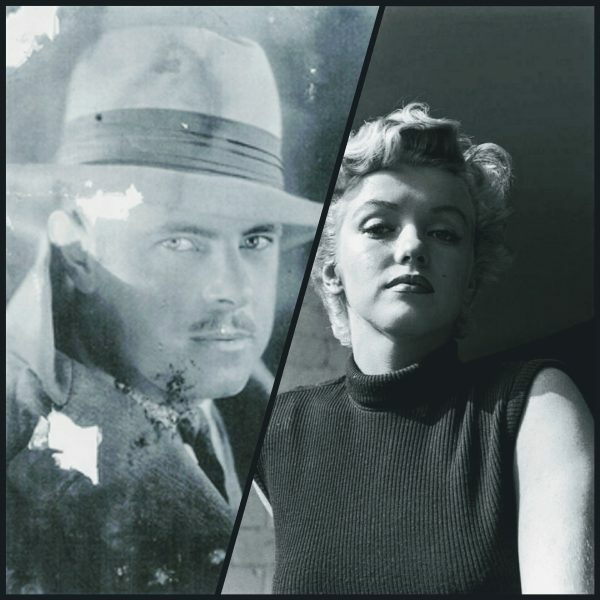 “Monroe was seen many times in the Hemet area, most times staying at the Soboba Hot Springs. She was seen making clandestine calls or stopping at bars (most frequently mentioned in the reminiscences of locals is Chappies Bar) and asking for a Charles Stanley Gifford. ‘My dad and mom were out at the Soboba Hot Springs for dinner, a very upscale dining spot in town. My dad started to get out of the car but was stopped by someone who looked familiar. The gentleman had gone to dad’s side of the car to let a woman out of the car. 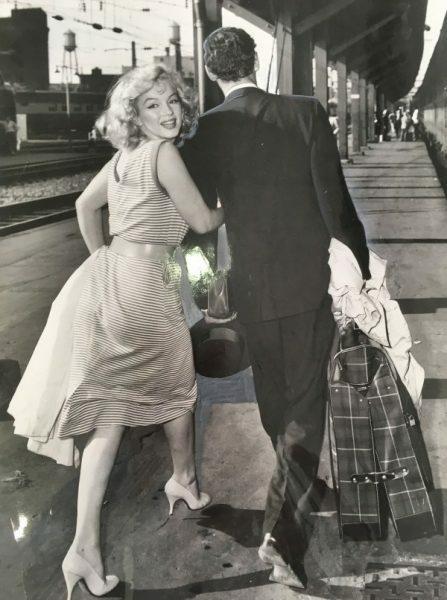 When the woman stepped out of the car, dad realised why the man had looked familiar; it was Joe DiMaggio, and he was holding the door open for his wife, Marilyn Monroe …’, said a smiling former Hemet mayor, Robert Lindquist. 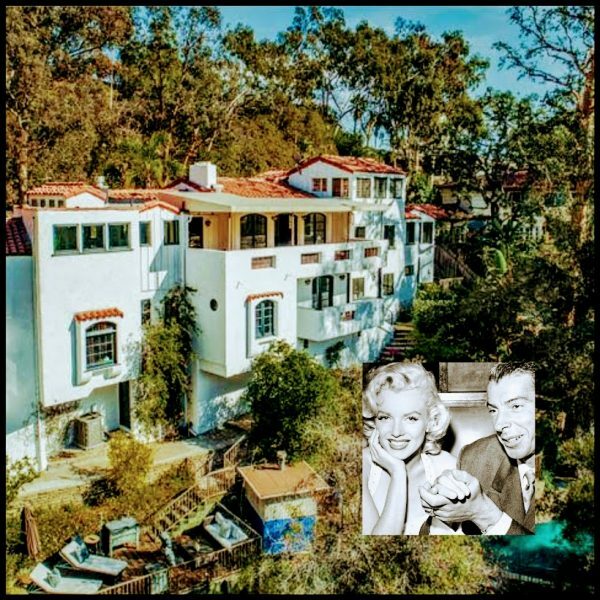 The Castilian Drive hillside property used by Marilyn and Joe DiMaggio as a romantic hideaway in the early days of their relationship (see here) has sold for $2.727 million – exceeding the asking price by around £300K, the Los Angeles Times reports. 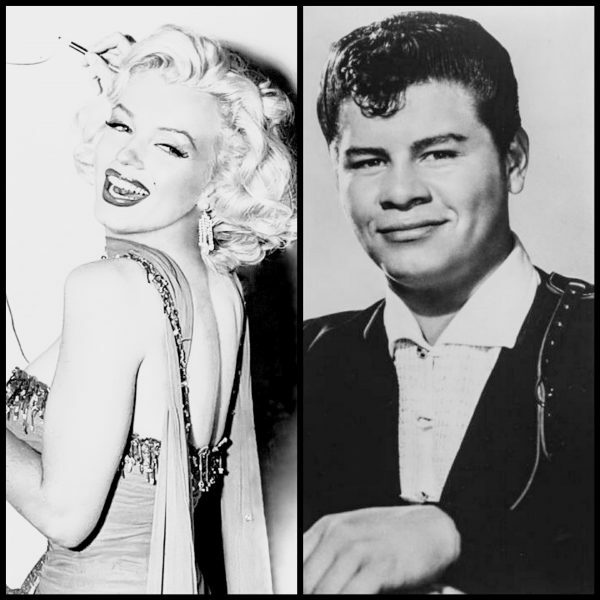 “During this awards season, I am proud to introduce two bills renaming post offices on Van Nuys Boulevard after two of the San Fernando Valley’s most famous and celebrated artists, Ritchie Valens and Marilyn Monroe. Forty-six of my colleagues from California joined me in honoring these amazing talents from our great state. 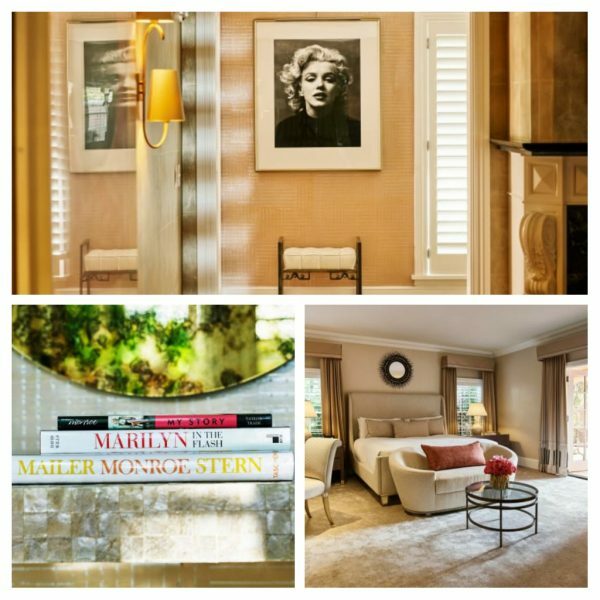 The Beverly Hills Hotel bungalow where Marilyn stayed with husband Arthur Miller while filming Let’s Make Love in 1960 (her co-star Yves Montand and his wife, Signoret, were neighbours) has been revamped with a Monroe-inspired theme, as Forrest Brown reports for CNN. 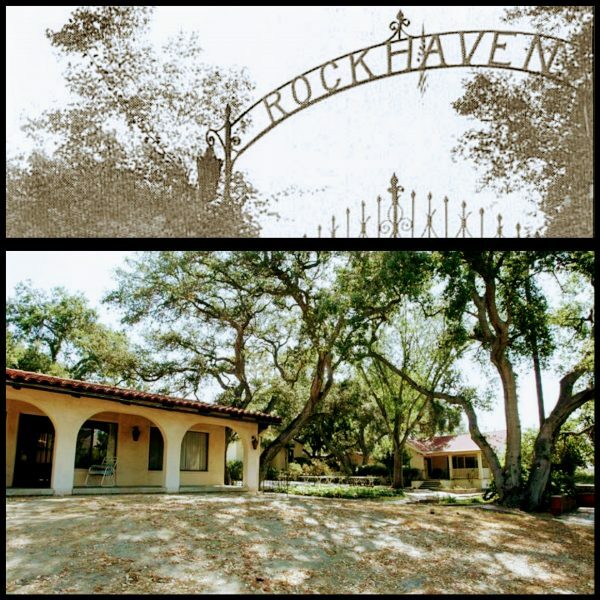 “It’s part of a years-long restoration project of 21 out of its 23 bungalows, the hotel says in a news release. Five take on celebrity-specific themes — bungalows that salute Elizabeth Taylor and Frank Sinatra made their bows in 2016, and fifth that takes its cues from Charlie Chaplin is set to come in July. Born Norma Jeane Mortenson, Marilyn Monroe became the ultimate symbol of glam and youth. The design of the bungalow reflects the Southern California lifestyle she liked so much, the hotel says. The space has a strong feminine vibe. 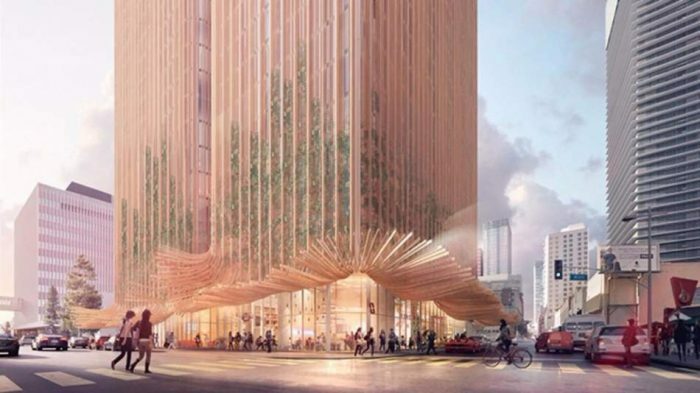 Guests will find sensuous, curvy furniture, bright and abstract floor coverings and gold-leafed ceilings. 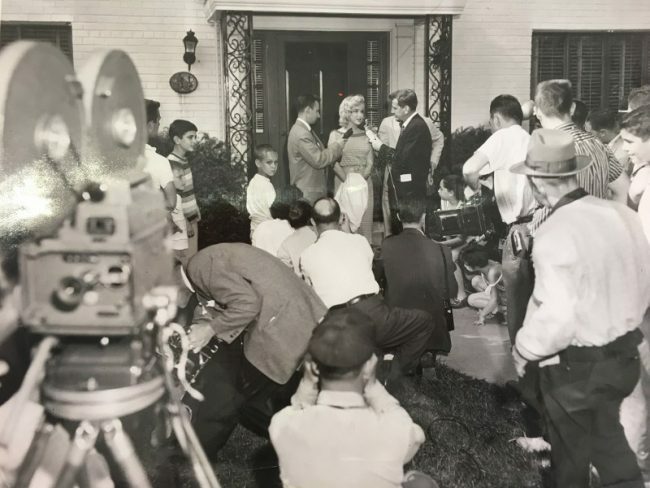 — A library featuring Monroe books and films, including the musical comedies Some Like It Hot and Gentlemen Prefer Blondes. — A Chanel No. 5 perfume bar (Monroe once said the iconic fragrance was the only thing she wore to bed) as well as bath amenities. — A bubble bath inspired from Some Like it Hot. You can even enjoy a meal inspired by some of Monroe’s favorites: Prawn Cocktail, Heirloom Carrot Salad, DiMaggio’s Spaghetti and Meatballs (that would be named after her former husband, baseball legend Joe) and Grilled New York Steak. The bungalow is priced starting at $8,500 a night for the main suite. Contact the hotel about adjoining rooms. Both the Monroe and [Howard] Hughes bungalows were designed by Champalimaud Design of New York. The hotel first opened in 1912, and its bungalows were built three years later for families that requested more space and privacy, the hotel says. 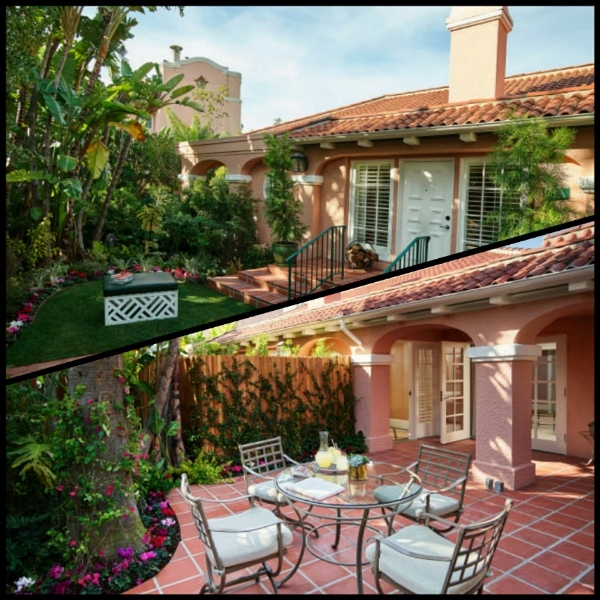 The hotel is known for its lush grounds and pink-and-green decor … The front entrance has a red carpet, which makes you feel like a celebrity just by walking in the door, and the palm frond-printed wallpaper reminds you that you’re in perennially sunny SoCal. 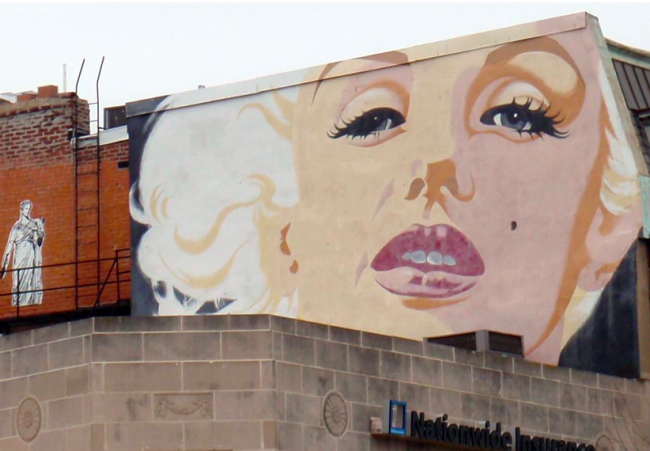 This Marilyn mural, in the Woodley Park district of Washington D.C., was commissioned almost 40 years ago by a local hairdresser. Roi Barnard, former owner of Salon Roi (and author of a new memoir) has shared the story behind this much-loved local landmark with the Washington Post. 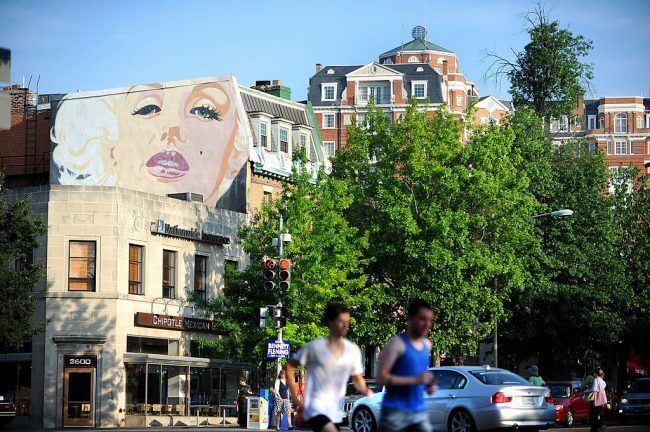 “What do you see when you look at Marilyn Monroe gazing down at the corner of Connecticut and Calvert streets NW? A beautiful woman? A movie star? An icon? Roi doesn’t seem sad now, at age 81. It wasn’t always that way. ‘I was a sissy little boy,’ Roi said. That was not an easy thing to be where he grew up: in tiny Poplar Branch, N.C., a place of dirt roads and outhouses … Roi came out of the closet in the 1960s, determined to be honest about his sexuality. He became a model, changing his name from ‘Roy’ to the more memorable ‘Roi.’ He learned to cut hair and worked as a hairdresser at the Washington Hilton. In 1969, he and Charles Stinson — his business partner and onetime romantic partner — opened a salon together. 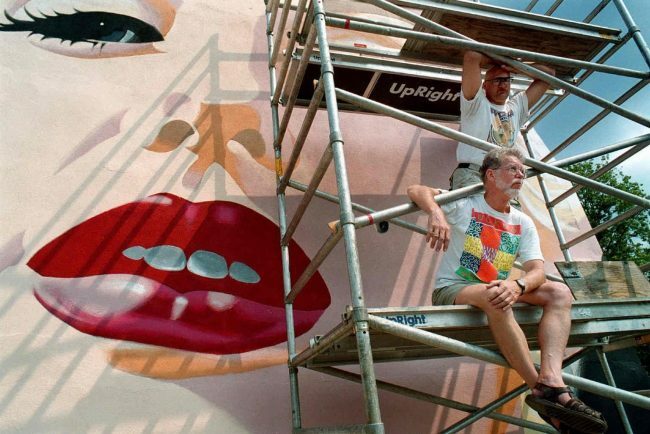 In 1981, Charles commissioned artist John Bailey to paint the Marilyn mural. 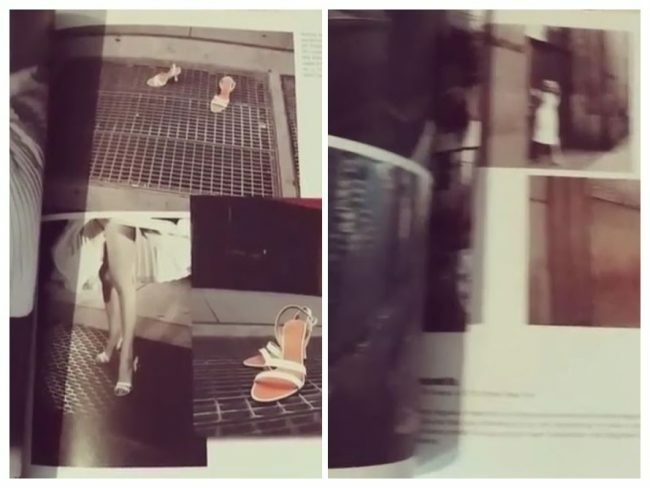 It’s become a landmark, even if most passersby don’t know how personal the image is to Roi.